Crude oil pulled back from its recent highs with WTI crude barrels back to the $72 level after peaking at $72.72, driven higher by incoming US sanctions on Iran and concerns about immediate supply being able to cover the loss of Iranian production in global markets. WTI Crude supplies showed another gain with an increase in inventories by 3M barrels totaling to nearly 400M barrels of excess supply. As expected, the weakness in the momentum has pushed the prices a bit to the downside to retest the purple trend line presented on the chart. 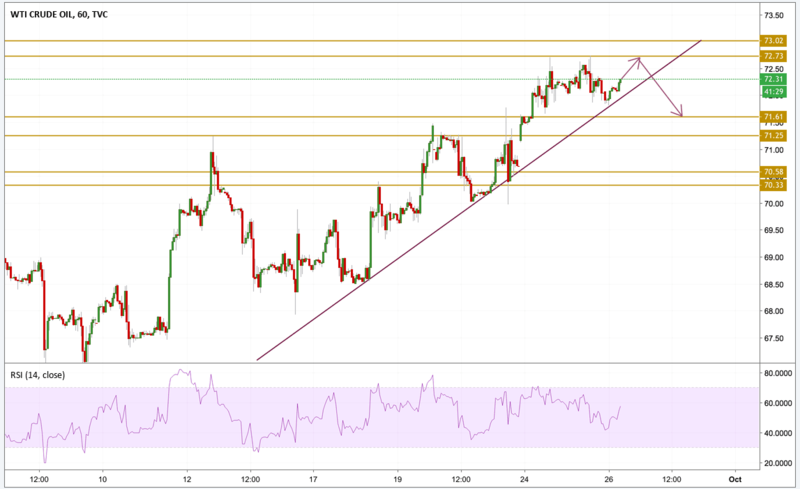 The price is currently back at the $72.3 level and seems to be heading yet again to the $72.7 resistance level but we have to be careful from divergences between the price and the momentum.